A lot of us think that having a child means that you have to change your entire life. You have to forget about yourself, because you will not have time for sport, yoga, and other activities which you used to do before. This is not the truth at all! People who can’t imagine their life without sport and other outdoor activities will find a way out from any situation. How to do this? Easily. With a jogging strollers. If you have never heard about such type of strollers, don’t worry. 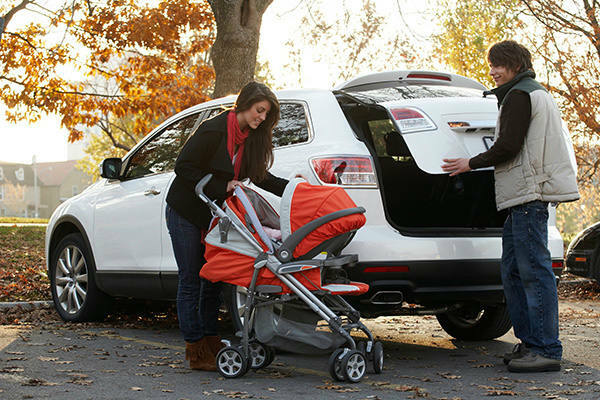 In short, these strollers were designed to give an opportunity for moms to continue their usual sport lifestyle and at the same time spend time with a baby. With the jogging strollers you will be able to make exercises and jogging every day. Moreover, due to the special construction, these strollers give an ability to use them even in challenging terrains, turning usual jogging or walk with a child into a funny entertainment for both child and a mom. 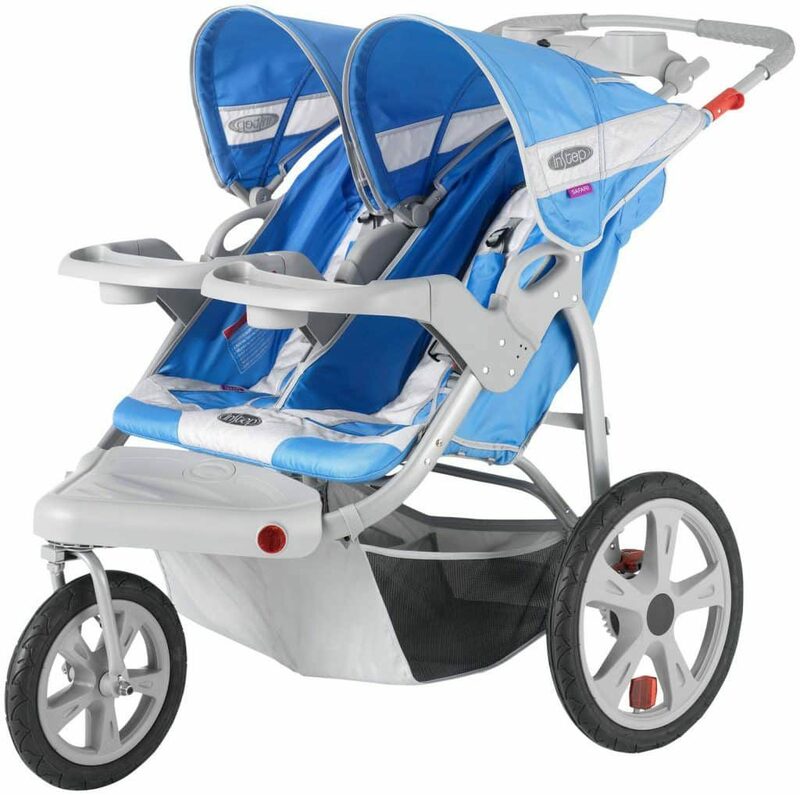 In this article we will review double jogging strollers and present you the five best models available today. Now, we have broken the theory that with a child you will not be able to find a time for yourself, and now it’s time to consider all unique features of the jogging strollers. Using such type strollers, you should always remember about the safety of your children, that is the main reason to check twice the recommendations on weight, children age and other features when choosing the stroller. All the jogging strollers are compatible with the car seats, so if your child hasn’t reached the age of six months yet, use of such strollers without car seats is prohibited and considered as unsafe. Also each stroller has the recommendations on weight, but if you increase the weight limits on five or six pounds, no one will punish you. Also, for determining the safest position of your children in the stroller (side-by-side and inline models are available) you should check the recommended age. 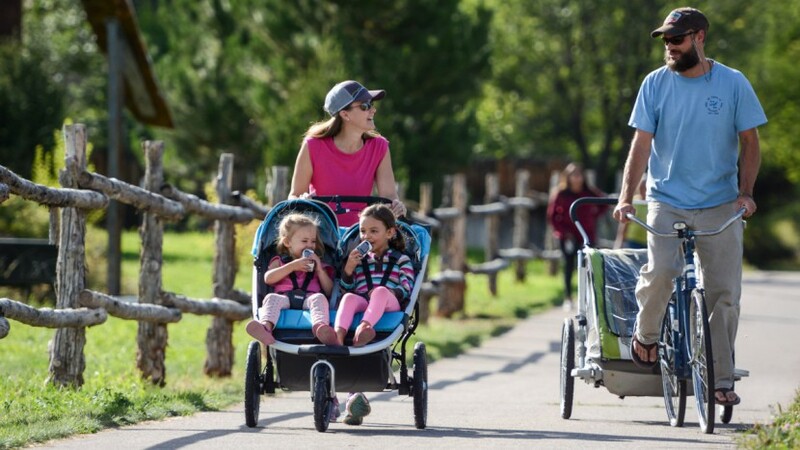 Jogging strollers are a great finding for many moms, but prior to purchasing it, think how often you are going to use this stroller as intended because if you prefer walking around the city than jogging every morning, this purchase will be rather a disadvantage for you than a pleasure. Note also, that all jogging strollers are quite heavy, large and bulky in comparison with usual strollers. Finally, you have learned what it is and how to use such strollers, and we are ready to start our review and present you the five best jogging strollers available for purchasing nowadays. Ready to choose? 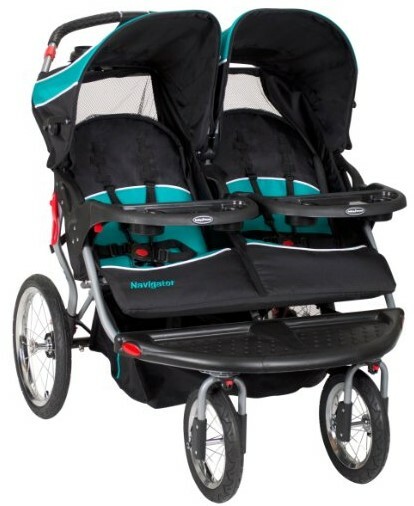 Number one in our comparison list of five best strollers for jogging is a model designed by InStep company. 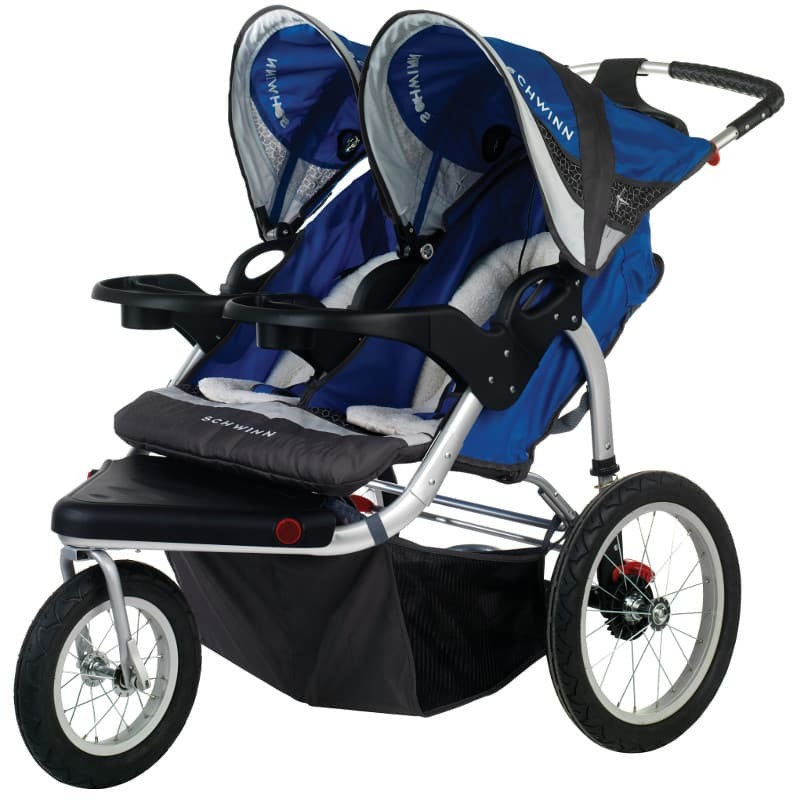 The main advantage of the InStep Safari Double Swivel Stroller is its price. In comparison with other similar options from more popular brands this one has the most affordable price and will not make you a bankrupt. Price of this option is around three times lower than, for example, Baby Trend model cost. Another advantage and one of the main reason to pay attention on this model while choosing is its unique dual trigger folding system. Thanks to it, you will be able to fold it quickly and easily, without asking someone else to help. Despite the fact that jogging strollers are heavier and bulkier than other usual strollers, this model is quite lightweight even loaded with two kids inside. Handles of this stroller are forty inches, so even if you are tall, you will not feel any inconveniences while jogging with this model. But besides advantages, this option has some cons also. 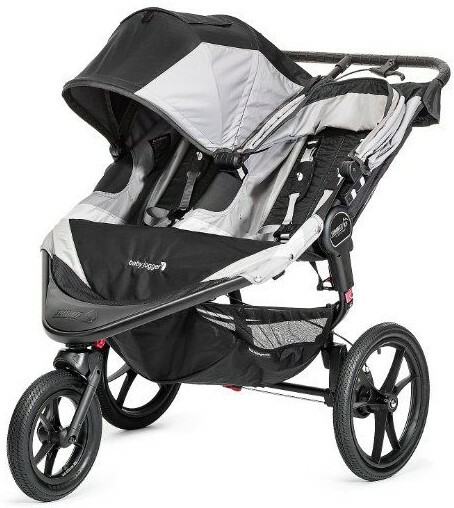 Among the main drawbacks of the InStep Safari Double Swivel Stroller are its width. The width of this model is equal to thirty-two inches, which is not super convenient even by taking into account that it still fits the most doors with a standard size. Another disadvantage of this jogging stroller is its seat pads, which are quite thin and may cause a bit discomfort for your kids. Breaks of this stroller are also located near the stroller’s wheels, which is also not the most convenient place. Having weighed all pros and cons of this model we can make a conclusion that this option is worth purchasing. It is a good budget option with all high-end characteristics necessary for the jogging stroller. Continuing the theme of the affordable jogging strollers we want to present you our second option made by Schwinn company. As well as the previous option, this one will also please you with its combination of a price and high-end features. Let’s start from the main advantages of the Schwinn Turismo Swivel Double Jogger. Main advantage and one of the unique features that stand this option from the crowd of similar models is its tires which are created by using a special technology and are filled with the air. Such construction gives you an ability to ride smoothly even on rough terrains. To start motion this option need only a small light push, so riding will not be difficult even when you put both your kids inside it. Another advantage is the pads of this stroller. Unlike the previously mentioned option, this one has a soft and quite thick pads, so you can be sure that your children will feel themselves completely comfortable even when you will be jogging through the bumpy roads. Next advantage which is the favorite one for most of the parents is the ability to adjust the handle bars of this stroller depending on your height to make it the most convenient in use. Each seat of the Schwinn Turismo Swivel Double Jogger can be reclined in order to fit all requirements and preferences of the little passengers. All these advantages are great, but don’t forget that this is a budget option, so it has several significant drawbacks also. 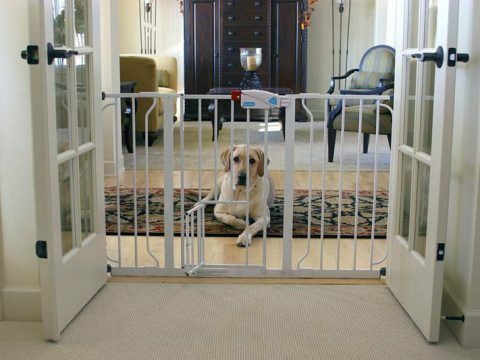 Among the main disadvantage of the current model which can cause some inconveniences is its size when folded. If compare with other similar but more expensive options, this one takes much more space in a folded condition, which can be a real problem if you are limited in space. Also, some parents have noted that the storage basket which is located at the bottom of this stroller is not convenient to getting things inside or taking them from it because of the bar which blocks it. Summing up everything mentioned above, we can say that if you are on a budget and need a good jogging stroller with all necessary features for convenient use, you will hardly find a better option than this one. 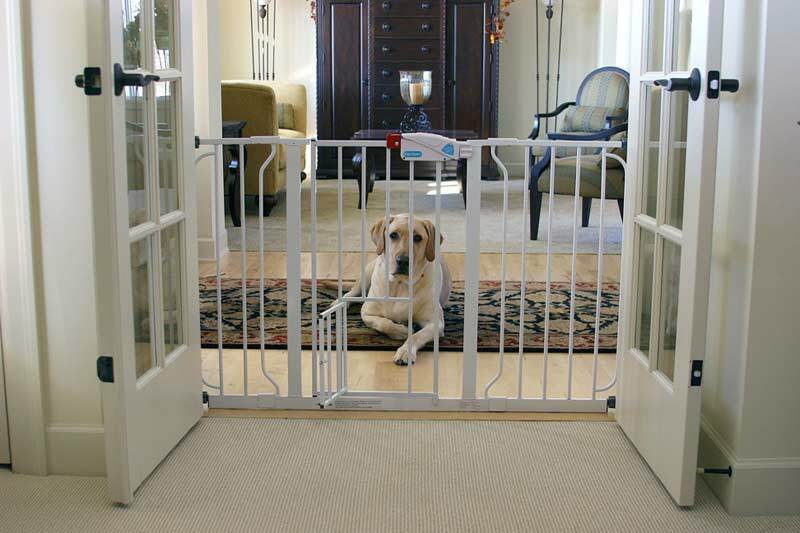 Affordable price and good features of this option will fit your requirements. Middle position in our comparison list is occupied by the jogging stroller designed by the famous Baby Trend brand. Although the products of this brand are considered to be a bit pricey, this one will please you with its price tag. The Baby Trend jogging stroller costs more than two previous options, but its price is still significantly lower than other strollers by Baby Trend cost. This model is not one of the budget strollers, so together with higher price you get better quality and more useful features. Let’s consider all of them. First thing that this model can definitely boast of is its maneuverability. Also, due to the specially developed design and pneumatic bicycle tires in combination with swivel wheel in the front of this jogging stroller, you will be able to ride it smoothly even on the rough terrains. One more advantage of tis stroller is its compatibility with almost all car seats. 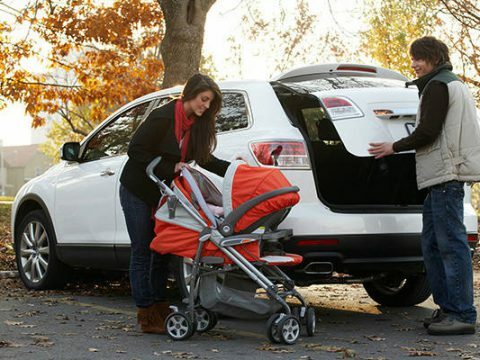 So, you will be able to attach two car seats simultaneously for your kids of the same age or with the small age gap. Each seat of this jogging stroller can be reclined providing the maximal comfort for your toddlers. Seats have soft pads, so even while jogging on the bumpy roads your little passengers will not feel any discomfort. Seat pads can be easily washed. The accessories of this stroller is also on the high level. It is equipped with the parent tray where two holders for cups are located, with two spacious storage baskets (with easy access to each of them) and two separated trays for your kids. Also MP3 speakers are included. Besides advantages this option has some drawbacks also. The main disadvantage of the Baby Trend jogging stroller is its size. This stroller is a representative of the large ones, and if from the one side such dimensions give a lot of space to your kids, from another side it can be quite inconvenient to load this stroller into a track, especially if you are limited in a free space for it. Another drawback which is predictable for such size is the stroller’s weight. Forty-three pounds is quite a lot, so most probably you will need some help while lifting this stroller. One more option designed by the Baby Trend brand occupies the fourth position in our comparison chart. As you may already guess, we came to the more pricey options in comparison with two economy-class jogging strollers that were reviewed at the beginning of our list, so the Baby Jogger 2016 X3 Summit Double stroller is definitely not on the cheapest side of all jogging strollers. 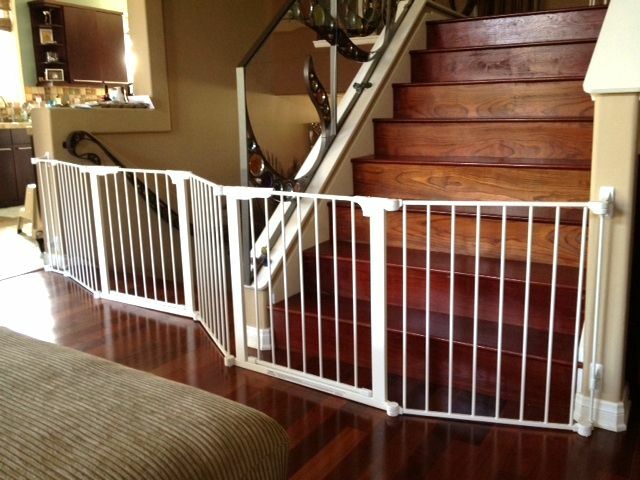 Actually, high price level and the handbars of this model that can’t be adjusted to the different heights are the main disadvantages of this option. All other features of this jogging stroller are on the high level. This stroller is convenient is use on all-types terrains due to the all-wheels suspension and specially designed tires which make riding smooth regardless of the road type. Even while jogging on the bumpy roads you can be completely sure that your children will feel themselves absolutely comfortable. Another advantage of this option is its compatibility with all types of the cars seats. All you need to fit this model with a car seat is to use a special adapter. As we have already mentioned, all features of this stroller are on the high level, so the comfort for your lovely kids is guaranteed. To achieve this comfort, manufacturers of this jogging stroller made it equipped with the large canopy that cover both kids and seats that can be adjusted into the multiple positions. You can even adjust a seat into the almost flat position so that your kid (or both of them) can sleep while you are jogging. Summing up all the features, we highly recommend this option for purchasing. It will fit all your requirements and its little passengers will definitely be happy. Finally, we reach the end of our comparison list and are ready to present you our last model of best jogging strollers available nowadays. Last stroller designed by the Duallie is probably the most successful combination of price and quality in our list. This option is not as pricey as strollers by Baby Trend but is equipped with all the necessary features for comfortable jogging. The BOB jogging stroller weights thirty-three pounds, which makes it one of the most lightweight options in our list, while its dimensions provide you with the good maneuverability. This model is also equipped with the special duo-folding system which allows easy and quick folding of the stroller. In the folded condition this option measures only thirty-one inches, so you can put it into your truck without any problems even when you are limited in a free space. 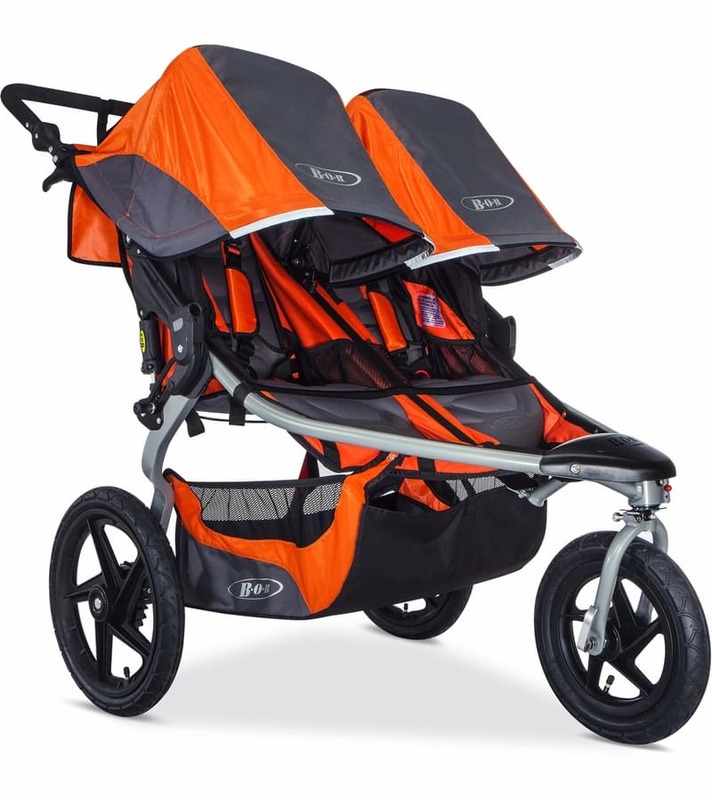 Unique feature of this jogging stroller is its swiveling front wheel that you can lock into the place and make your jogging safe and comfortable for the stroller’s passengers. Among other advantages of this model created by the Duallie brand are its spacious storage basket and two seats with the soft pads. Seats can be reclined independently, so that you can provide the maximal comfort for your kids. The recommendations on weight for the kids are up to fifty pounds each and it’s not recommended to use this jogging stroller for babies who are less than eight weeks old. It was the last option in our list and as well as all models reviewed above are worth your attention and will not let you down. We hope that our article was useful and wish you the safe and pleasant jogging!